To celebrate the 4th, we had a few of my coworkers over for dinner on Friday night and a party for our neighbors on Saturday. Both of those were fairly tame, minus a visit from the Peoria Police... Apparently all of our neighbors aren't the firework-fans that my dear husband is. In preparation for a houseful of people, we knew that Addi really needed a nap, so we made sure to put her down around her normal nap time. She naps great at the sitter's, but at home on weekends it's usually a bit of a struggle. It can take up to 30 minutes to get her to calm down, but forgo the nap and you are risking a toddler that has the energy of a tiger on Quaaludes with the crabbiness of a fat guy on a diet. Anyway, off she went to nap while Sami hung out in her swing and Jay and I worked on the backyard. A little while later Jay said, "Steph, I think Addi is awake." I asked, "Why, can you hear her screaming?" 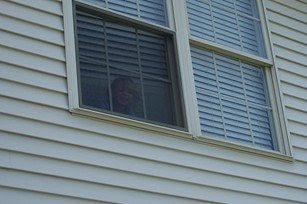 and he said, "No, I can see her," and pointed to her room. Obviously, she was awake. No, her bed does not belong clear across the room. No, we don't let her stand on her headboard. 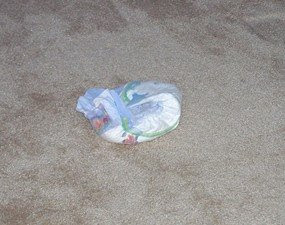 And no, we don't let her nap without a diaper. She apparently disagreed and took it off herself. As frustrated as I was, there wasn't much we could do other than move her bed back and hope for the best the next time. 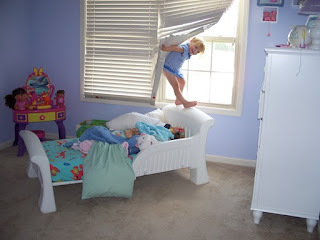 Oh, and lecture her on climbing the windows... Although sometimes it seems like the more we tell her not to do, the more ideas she gets of things to do wrong. 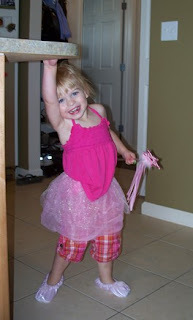 Later that day, Addi wanted to wear her princess/ballerina outfit and dance around the kitchen. She was so cute, spinning and having a great time, that it just made me see again why I love her so much... she has the best personality and is so darn sweet and cute sometimes. She can be a devil one minute and a complete angel the next... It sure does keep us on our toes! I guess the horns are just there to hold up the halo. "I guess the horns are just there to hold up the halo." Hilarious....oh my, you crack me up!